Maura Sheedy is 20-years-old and when she was a junior in high school, she went makeupless. No foundation. No mascara. No eyeshadow. No lipgloss. No eyeliner. For Maura, this was a test to see what she could learn about herself and the world around her. We’ve seen celebrities go makeupless and use hashtags to prove it, but Maura led the wave of influence in her community. Maura even showed up for homecoming without the lightest of highlighters – “the lone bare-face there,” this young ambassador for embracing self says. It’s been nearly four years since Maura spent 365 days without makeup and today, she’s the founder of MAKE, a news and media hub that supports feminist voices by increasing awareness about gender inequality and pushing back against misrepresentations of beauty. Maura hopes that MAKE empowers other young people to learn about feminism and ask questions about societal beauty standards. You started @make.bymakeupless on Instagram when you were 16-years-old in your hometown of Pittsburgh, PA. What inspired you to launch this brand? It all started when I was a junior in high school. I was walking to a friend’s house to spend the afternoon getting ready for a football game. As the whole group of us made our way, I remember thinking that all we ever seemingly talked about was what we are going to wear, how we are going to style our hair, and, of course, what kind of makeup we were going to [apply]. I was exhausted from talking about this over and over, and the idea popped into my head to go a year without it. I said what I was thinking aloud and I meant the idea as somewhat as a joke, but when my friends starting doubting me, I knew that I wanted to prove them wrong. I (ironically) did wear makeup that night to the football game, but began my year without makeup that [following] Monday – Sept. 1, 2014. What kind of challenges or comments did you face when you were 16 and went an entire year without makeup? Did you find yourself fighting back? I actually mainly received of support and am so grateful for that. But, like anything, there’s always some criticism. I remember noting that two people throughout the year made negative comments – which is such a small fraction. However, there definitely were people who gave me the impression that they did not see the point of [going makeupless] or did not think it was a big deal. I agreed with them – lots of people do not wear makeup. But at the end of the day, I reminded myself of the truth: the project was to combat societal beauty standards everywhere and to show that you do not need to succumb to pressure to wear makeup. Makeup affects so many industries, economies and cultures. It does have more importance in our world than one might think. Makeup can be a way to express creativity and self and for me, makeup makes me feel put together and confident. I wear makeup for me, but it wasn’t always that way. In high school especially, there are many pressures to look and be a certain way to fit in. What did you learn from your year without makeup? That’s exactly the kind of reason to wear makeup [and one that] I promote: to wear it because you want to (and not to feel the need to wear it all the time if you do not want to). I personally wear light makeup most days, but not every day. I use it because I want to – not because I feel like I should. I think in high school especially (and even for middle-school ages), there is a lot of pressure to fit in and [follow the crowd]. Things I learned from my experience had more to do with bettering my character. I gained so much confidence, in not only the way I look, but in my ideas and beliefs, too. I felt that after, I could do anything I put my mind to. I knew that I could be a leader and an activist to make change. The experience definitely made me realize my capabilities. Were there any other students in your high school who joined you in this makeupless journey that year? No one else did a whole-year without makeup with me. People would definitely let me know when they were not wearing makeup though, which was fun. There were times when people mentioned to me that I had inspired them to wear [makeup] less. I went to an all-girls high school, so I definitely was not alone when I showed up for school makeup-free every day – it was pretty commonplace to not wear makeup while at school. The no-makeup trend has been adapted by numerous celebrities – Alicia Keys comes to my mind immediately. What are your thoughts on celebrities taking this stance? Yes! I think it’s awesome that people are hearing about the no makeup movement and all of the benefits that [it] has for your skin, confidence and self-perception. I like to think that I [am] a part of the change-makers too – even if I’m not a celebrity. We do, however, need known names to spread the word. I think celebrities have an even more crucial role, because makeup is so heavily used in the entertainment industry and the media and Hollywood promote false realities [and standards]. Now, MAKE serves as a platform to exhibit that women and girls can be leaders, activists and creators and it encourages girls and women to use their power to make change – not only in the world of beauty. When did MAKE officially launch and what type of change do you think the brand has helped lead or enforce since day one? I am so excited about MAKE and have dedicated so much of my time to developing this new platform. I more or less began constructing MAKE in October  by building the website and revamping the Instagram. I consider MAKE to have been fully functioning by December , as that’s when I began posting daily articles and started our first campaign on Instagram. Since day one, MAKE has been about making a change to societal standards beyond beauty. Since makeupless (my year without makeup) ended, I knew that I wanted to continue the project in some way. The year without makeup was about empowering women. I wanted to do that across all aspects – touching on women in business and leadership is the most important to me, currently. I never considered myself a feminist until my year spent without makeup. [I treated that year] as a personal research project and I dived into learning more about society and beauty, the lack of confidence women feel in themselves and the effect that the beauty industry has had on women and girls. So much of it came down to feminist beliefs and a push for equality in our world. I created MAKE as a place for information and inspiration. It was not until I had those aspects in my year without makeup that I became a feminist or understood its roots. I want MAKE to help (get it – make is a helping verb) others learn, as well. In December 2017, MAKE hosted an Instagram contest called #12DaysofMAKE. Twelve young women took over MAKE’s Instagram stories, telling the world how they embody what it means to make change and lead. What inspired you to launch an Instagram campaign like this? A few weeks ago, I was lying in bed about to fall asleep while thinking of ways to grow the MAKE community. It kind of hit me that MAKE was still revolved around me on Instagram. I wanted to change this and the idea to feature other amazing women on the account came to my mind. The campaign happened 12 days before Christmas, thus the name – #12DaysOfMAKE. It was so successful that I just did one in January as well called #TheMAKEGeneration. [We had] takeovers [from people] aged 13 to 19. Photo by: Caroline O’Kane Photography. What type of results – in terms of engagement and awareness – did you see during and after #12DaysofMake? The results especially for #12DaysOfMAKE were amazing. I saw so much interaction on the account. It was one of those moments where you’re so proud of what you created. A lot of people told me how much they liked [the campaign] and saw that I was working to revamp [the brand]. It was cool to gain followers that never would have found MAKE otherwise. The power of social media baffles me in instances like this. Social media campaigns can be fun – but also time consuming and often result in questionable numbers. What was one of the biggest challenges you faced with #12DaysofMake? Tell me about it! No one realizes the behind the scenes work of recruiting different people to takeover, coming up with content, managing the page with another person on it and so forth. I think the hardest part was juggling everything else and worrying about the account, while doing the campaigns. I am a student, I have an internship, I am involved in numerous organizations on [my school] campus and I have a social life. Balancing MAKE without the campaigns on a normal day is already a lot! I have definitely learned how to stay organized with all of my work. What advice do you have for other brand-owners and leaders hoping to launch their own social media campaign this year? Take the time to plan. Come up with a theme and how you plan to market the campaign. Decide on the number of days you want it to last. I suggest anywhere from about four to eight days. Reach out to more people than you think [you might need] to participate, because there will be those who do not answer. Do not be afraid of direct messaging someone! Decide whether you want people to just [share updates on the account’s Instagram] stories or fully take over the account. Be clear on this! Give people freedom to take your campaign how they wish. This might [lead to] things that you may not have thought of. Use the [campaign to leverage] your brand to a new market. Connect with new people! MAKE also houses content submissions that showcase subjective meanings of beauty and journeys with self-love and sometimes, also self-hate. Why is this online community so important for you and the MAKE brand? I’m very passionate about giving people a space to share their voice. Our own experiences are the voices of our community and culture. When joined together, these personal experiences are how we can create a change. I have two ways people can contribute on makebymakeupless.com. One is through our submissions section, which gives a space to submit writing or art, [specifically highlighting journeys] with [understanding] gender and feminism. I also have a community page called #eyesofmake, which revolves around sharing personal experiences with inequality. The community page stems from the work of my friend Larz and her project called #HalfTheStory. I admired this project because it built community by creating an online space to share experiences, fostering a [united] sense of needed change in the way we use social media. #eyesofmake does the same, but fosters a need for change in the way we treat women. Social media has the power for positivity, authenticity and genuine connectivity. What support does MAKE provide to contributors? MAKE does its best to support everyone who takes interest in, follows along and submits content related to [our brand]. MAKE wants to help [artists] expand [their] own brands and links work back to the creator’s portfolio or social media [profiles]. Submissions and #eyesofmake posts are shared on our social media platforms, as well. The plan is to feature submissions in a newsletter and possibly a digital magazine! Who makes up the MAKE team? Are you a one-woman team? Right now, I do 95 per cent of the work. My lovely sister, Erin, who is 17 and a senior in high school, writes the weekly newsletters. Our newsletter takes the top five or six stories shared to the site daily (I share 50 per week, 10 each day – Monday through Friday) and puts them in one email sent to subscribers every Sunday night. I’m hoping to start up a part-time internship-style program for those who want to get involved, as we grow. 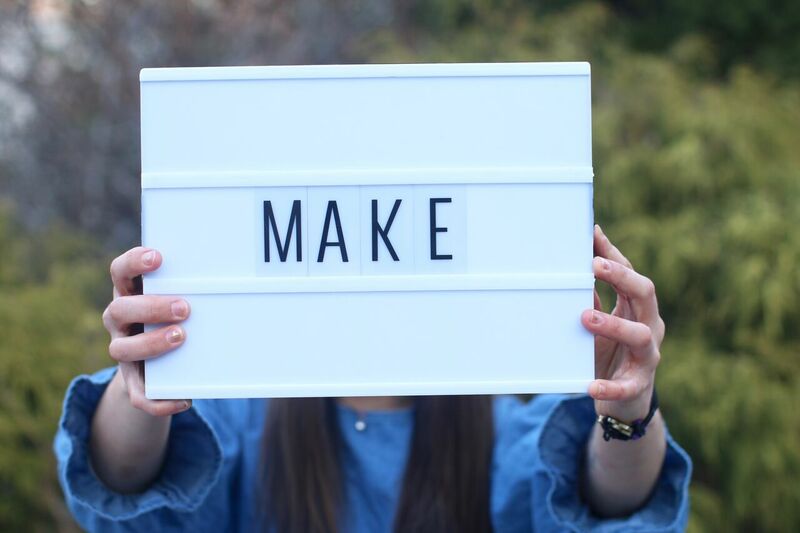 Candidates interested in positions revolving around communications, design, tech, and public relations will have the opportunity to work remotely for MAKE. What does the future have in store for MAKE? The sky is the limit for MAKE! I hope for us to be a full-service media platform, with a large web and social media presence. I have thought about starting a podcast or launching a section of the site to list upcoming events, conferences, networking opportunities as well as products and services. Additionally, I have had hopes of publishing a book about my experience living makeupless and how this shifted my views to seeing a need for change. I have a rough draft done that is about 30,000 words and would like to add another 10,000, detailing this first year of MAKE. It would be a dream to have that published as a physical journal in a few years. Do you have a story to share about how you’re making change and empowering others within your community? Submit your journey on www.makebymakeupless.com. Work is screened to make sure it fits with timely themes and is lightly edited for any grammar and spelling mistakes. “I try to get back to everyone in a few days – I do reply to all submissions,” Maura says. Maura, we’ll be keeping our eyes out for your upcoming book and encourage everyone to subscribe to MAKE’s newsletter! Until then, find out everything you need to know about MAKE on Instagram, Facebook and Twitter.